Cycling purists who steadfastly believe that riding a bike when combined with a swim and a run does not constitute proper racing may want to avoid visiting their local Virgin Active this weekend, because the gym chain is making the multi-sport world even less competitive with an innovation called “Indoor TRYathlon”. Worn out by five kilometres on an exercise bike? Then take a breather in the pool, as demonstrated in the promotional video below. Actually, it looks quite fun – but of course that’s what they want you to believe. All bizarre cults seem enjoyable and harmless at the beginning. You won’t be laughing a few months later when you’re running barefoot through the East End while wearing a wetsuit. Resist, chums, resist! Attention thrill-seekers! Forget the Cape Epic or the Norseman Xtreme Tri – Detroit should be your next international destination for seat-of-your-pants racing now that a group of “renegade landscapers” has unearthed a lost velodrome buried beneath 30 years of overgrown weeds. Despite the surface having more cracks than a 42-page theory about doping on the Bikeradar forum, the organisers have bravely included a “Geared Road Bike class” in their motorsport-centred racing programme. You know what that means, don’t you? Book those plane tickets – we’ve found a temporary replacement for Crystal Palace! UCI officials banned the Bont Crono on Wednesday, purportedly because the time trial-specific shoe “influences the performance of a rider” by, er, being more aerodynamic. Noting that TT helmets perform a similar job, sniggering fashionistas have argued that the Swiss spoilsports took issue with the Australian company’s latest innovation simply because it was aesthetically displeasing – and they’re probably right. At last: a decision by cycling’s governing body we can all agree makes perfect sense. The staff at Condor had a pleasant surprise on Wednesday when Boris Johnson bumbled through the shop’s electronically-activated doors with his Marin hybrid – the very same bike he had bought from the famous Gray’s Inn Road store some years ago. 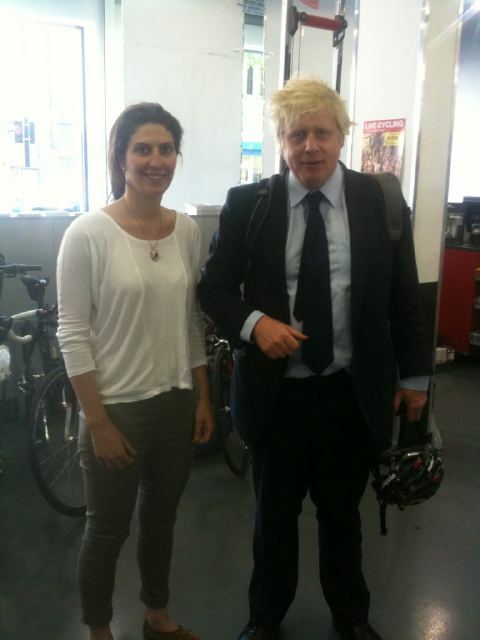 This photo of Boris, pictured alongside Condor’s Claire Beaumont, pleases The DYNAMITE! Files in many ways. For a start, the London Mayor is in our favourite cycling emporium. Then there’s the suit – a big tip-o-the-hat to anyone who refuses to compromise the integrity of high office by wearing Lycra. But most of all, it’s the shagged-out look on his face. Apparently the pedalling politico cycled all the way from City Hall – a distance of almost three-and-a-quarter miles. Who says politicians don’t know the meaning of hard work? This entry was posted on	May 6, 2011 at 2:58 am	and is filed under The DYNAMITE! Five.